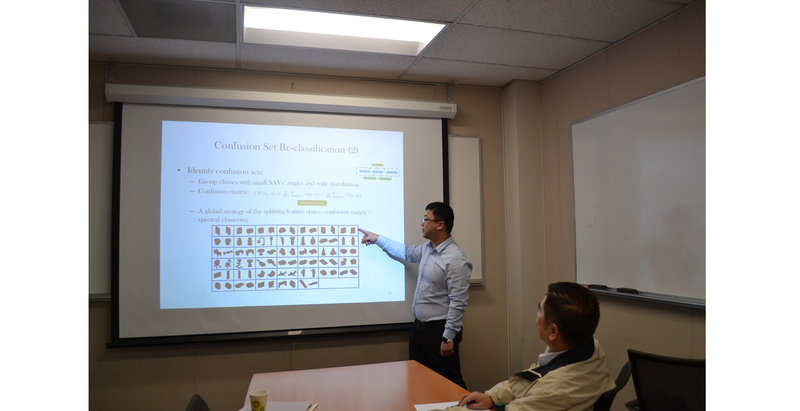 Congratulations to Xiaqing Pan for passing his defense on January 23, 2016. His Ph.D. thesis is entitled “Machine Learning Methods for 2D/3D Shape Retrieval and Classification”. Shape classification and retrieval are two important problems in both computer vision and computer graphics. A robust shape analysis contributes to many applications such as manufacture components recognition and retrieval, sketch-based shape retrieval, medical image anaysis, 3D model repository management, etc. In this dissertation, we propose three methods to address three significant problems such as 2D shape retrieval, 3D shape retrieval and 3D shape classification, respectively. First, in the 2D shape retrieval problem, most state-of-the-art shape retrieval methods are based on local features matching and ranking. Their retrieval performance is not robust since they may retrieve globally dissimilar shapes in high ranks. To overcome this challenge, we decompose the decision process into two stages. In the first irrelevant cluster filtering (ICF) stage, we consider both global and local features and use them to predict the relevance of gallery shapes with respect to the query. Irrelevant shapes are removed from the candidate shape set. After that, a local-features-based matching and ranking (LMR) method follows in the second stage. We apply the proposed TSR system to three shape datasets: MPEG-7, Kimia99 and Tari1000. We show that TSR outperforms all other existing methods. The robustness of TSR is demonstrated by the retrieval performance. Second, a novel solution for the content-based 3D shape retrieval problem using an unsupervised clustering approach, which does not need any label information of 3D shapes, is presented. The proposed shape retrieval system consists of two modules in cascade: the irrelevance filtering (IF) module and the similarity ranking (SR) module. The IF module attempts to cluster gallery shapes that are similar to each other by examining global and local features simultaneously. However, shapes that are close in the local feature space can be distant in the global feature space, and vice versa. To resolve this issue, we propose a joint cost function that strikes a balance between two distances. Irrelevant samples that are close in the local feature space but distant in the global feature space can be removed in this stage. The remaining gallery samples are ranked in the SR module using the local feature. The superior performance of the proposed IF/SR method is demonstrated by extensive experiments conducted on the popular SHREC12 dataset. Third, the design, analysis and application of a volumetric convolutional neural network (VCNN) are studied to address the 3D shape classification problem. Although a large number of CNNs have been proposed in the literature, their design is empirical. In the design of the VCNN, we propose a feed-forward K-means clustering algorithm to determine the filter number and size at each convolutional layer systematically. For the analysis of the VCNN, we focus on the relationship between the filter weights (also known as anchor vectors) from the last fully connected (FC) layer to the output. Typically, the output of the VCNN contains a couple of sets of confusing classes, and the cause of these confusion sets can be well explained by analyzing their anchor vector relationships. Furthermore, a hierarchical clustering method followed by a random forest classification method is proposed to boost the classification performance among confusing classes. For the application of the VCNN, we examine the 3D shape classification problem and conduct experiments on a popular dataset called the ModelNet40. The proposed VCNN offers the state-of-the-art performance among all volume-based CNN methods. I would like to thank Prof. Kuo for admitting me as his PhD student and advising me in my PhD study. He offered me so much patient guidance for my research so that I could get my PhD smoothly and successfully. Besides the capability of doing research, I have learnt many useful and precious skills from both Prof. Kuo and his group, for example, skills of presentation, writing, communication, logical thinking, analyzing problems and so on. These trained skills help me be more competitive in my future career. Moreover, Prof. Kuo’s diligence, self-discipline and humbleness influence me so much so that I could improve and keep improving my personality. I am grateful that I gained such an invaluable experience in Prof. Kuo’s research group. Congratulations again to Xiaqing and we wish him all the best in his future career.